Its been a great month for reading – Not just for me but for the girls too. I can’t say my TBR pile has shrunk though – If anything, it has grown. I’m seeing so many lovely books around that I simply must read. I’ll share some of those books with you in a future post. So let’s get straight on with what we have read? As a lifelong fan of the Poseidon Adventure, this book really appealed. A group of people find themselves in a lifeboat after their luxury liner sinks when there is a fire on board. The book explores the relationships between the people on the boat – there are far too many people on there, some will have to die. This isn’t a quick book. There’s not a whole lot of action but it is gripping. Some scenes are a bit too long winded for me but others really drew me in. I can’t say I particularly liked any of the characters but think this was intentional by the author. One thing that spoiled it for me was finding out whether or not they were rescued (I think I read it on Goodreads but won’t spoil it for you). The ending came rather abruptly for me. I read this as a buddy read with my middle daughter (aged 10) and her friends. We read this as part of a book club with MumsNet and absolutely loved it. It was great to read along (and out loud) with my daughter. For a full review, see our write up, along with pictures of our book group. Bit of a watery theme this month! I love a book about siblings so was really intrigued by this book. Katie wakes to a visit telling her that her younger sister, Mia has been found dead at the base of a cliff in Bali. Mia has been on a round the world trip and is presumed to have committed suicide. Katie refuses to believe that Mia would have done this and sets out to literally retrace her sister’s steps to find out the truth. There was definitely a feeling of trepidation with this book – I found myself suspecting a number of characters that came into the book and wanted to keep going until the end was revealed. I really enjoyed this book. It took me a few chapters to get into the flitting between the characters but it was definitely worth persevering. A good holiday read. I was slightly apprehensive about this book. I took it out of the library but then read a couple of reviews where the readers said they were very emotional throughout the book. I knew it was never going to be laugh a minute (it is a book about death after all) but didn’t want to feel wrung out by the end. I was pleasantly surprised actually – I don’t think I’m particularly heartless but I definitely didn’t find this book a weepie. There were moments when it got me thinking about how my girls would be without me which is always going to be hard but on the whole, the book was quite uplifting and heartwarming. Thought this book was great. A real thriller that had me hooked from the start. I’m known for loving a suburban drama so this was just up my street. My first Kathryn Croft novel & a pleasant surprise. Suitable for fans of Clare Mackintosh & Rachel Abbott. Tara arrives home after a drunken night over at a neighbours. What started out as a quick drink has turned into a nightmare as she has just left her neighbour dead in his bed. The story follows the police investigation and Tara’s quest to find out how the murder happened. I didn’t have a clue whodunnit for most of the book which is always a good start. Some very clever twists and turns and not in the slightest predictable. I will definitely be reading more Kathryn Croft’s in the future. I received an advance copy of this book via Net Galley in exchange for an honest review. I expected this book to be much more of an action thriller. This book surprised me though – it was much more gently but compulsive reading anyway. Gav & Lou move next door to Sara and her family. Sara is desperate to meet the new neighbours and quickly sets out to become Lou’s friend. There was something compelling about the relationship between the 2 families, although I’m not sure I would have ever wanted to be Lou & Gavin’s friends. There were moments when elements of the storyline were fairly predictable but not to such an extent that the book was too spoilt. Definitely a feeling of tension throughout – I was expecting more of an explosive ending which didn’t happen but still worth persevering. I received an advance copy of this book via Net Galley in exchange for a fair and honest review. This month I also hit 100+ in my mission to read 500 books by the time I’m 50. I’ve got just over 6 years to go *weep* so am fairly behind schedule. I always knew I would read more as the girls got older though, so I’m not worried about hitting target. If you are interested in keeping up with my challenge, I list the 500 books and their reviews here. 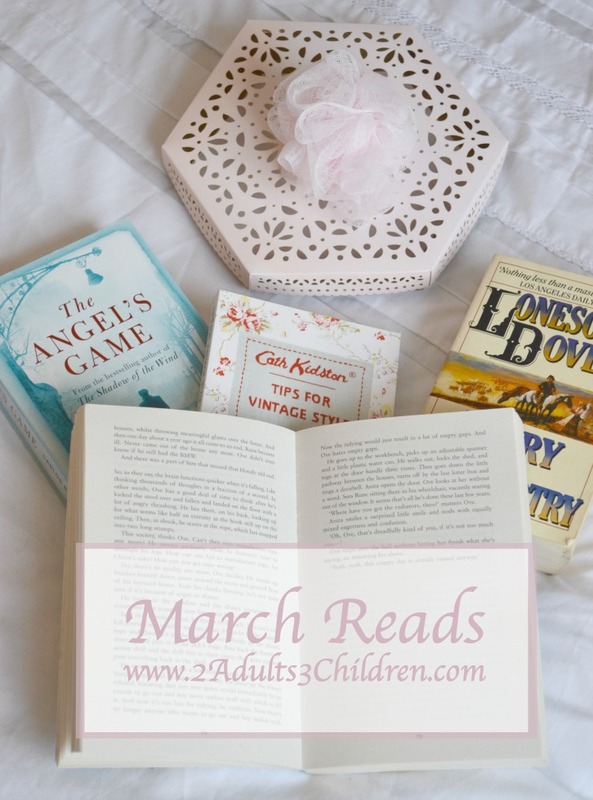 March was a good reading month for you! I am really interested in reading While you were sleeping and The People at Number 9, they both sound like excellent reads. I have read some of Kathyrn Crofts books and really enjoyed them. The Lifeboat sounds very interesting. Now I’m reading a book about the survivors of the Titanic and I like it a lot, I might read this one too, it should be similar. It does sound like the sort of book you would enjoy. I’m glad I stuck with it. What a great selection – I think I would like the Dead wifes handbook…pleased you enjoyed it! I like the sound of While You Were Sleeping. It looks a great book. Well done on reading so much this month! I love reading and never seem to do enough of it these days. The Lifeboat looks like something I’d really enjoy, thanks for your suggestions! March was really great reading for you! I really should try to read more often! I haven’t picked up a book over five years. It is on my list but then I am getting carried away with other things such as blogging and social media. It’s bad really. You got through a fair few books there how do you find the time? I don’t have time to read anything unless I go on holiday. I haven’t read any of those yet. Fab books. I would love to read While you were sleeping. I will look out for it. While You Were Sleeping sounds like it would be really good. I am looking for book ideas for the summer so I will add that one to my list. Haven’t ready any of these, will check them out as I seem to be whizzing through books at the moment! Wow. What a list. I dare not buy any more, my reading pile is becoming a health and safety hazard. Thanks for reminding me to get stuck in! Great post for keen readers!